Until this past Friday the 13th, it had been a while since I'd done a late night Disneyland photo run. However, the park being open until 1AM enabled me to do just that on my way back home from a concert in L.A. This was also my first time being able to take photos of a nearly deserted park during Halloween Time, and I must say, the atmosphere was most certainly charming. The romantic autumn hues gave a warm, welcome effect, and I thought, It sure would must been nice to be in a real turn-of-the-century town during this time of year! I imagine the atmosphere would have been quite magical in those more innocent times. 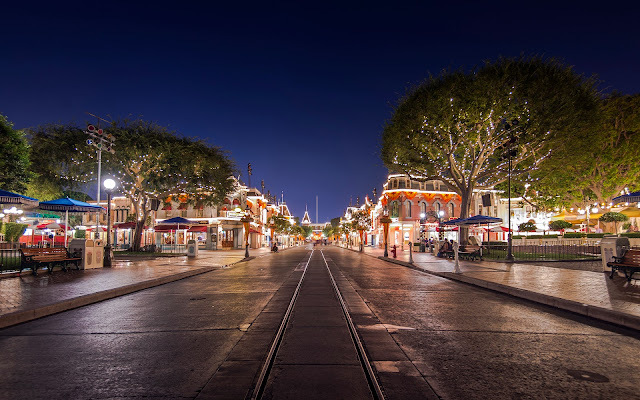 A nearly empty Main Street in the early morning, during Halloween Time.